I recently had the pleasure of visiting the digital court team in Sydney to see their new online services for jurors. The team is also working on a whole range of other projects, including a court and tribunal database and audio-visual services for prisoners. Their work is of interest to what we're doing in the UK, not least because it shows how much progress a small team can make in a relatively short period of time with the right support and an iterative, user-centred approach. The New South Wales team took me through their Juror Service and the Jury Management System, both of which went live in January. 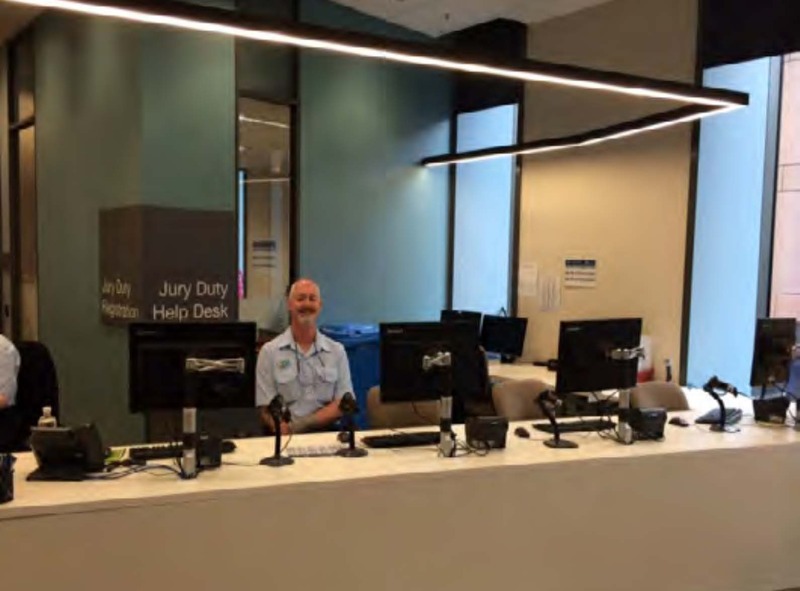 The service manages the selection of around 200,000 jurors per year from the New South Wales electoral roll and ensures there are enough jurors to attend courts across the state. The old admin system, which used a green screen and codes, was 20 years old. It was complex and it took staff a long time to learn the system. The service for the public wasn't digital and relied on paperwork and phone calls. It took 18 months to deliver the new service, which was made up of 3 parts — the user-facing service, staff administration and service analytics. It has been a huge success, with 71,000 users logging in since launch. The team was multi-disciplinary, with user experience (UX), development and service teams working together. The user interface (UI) and branding were outsourced to a branding agency who referred to the simple, clear style of GOV.UK. 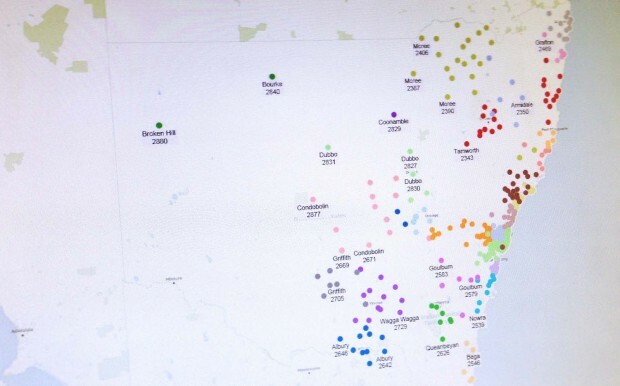 The result was great user experience for both staff and public users, which has now sparked interest from other Australian states. 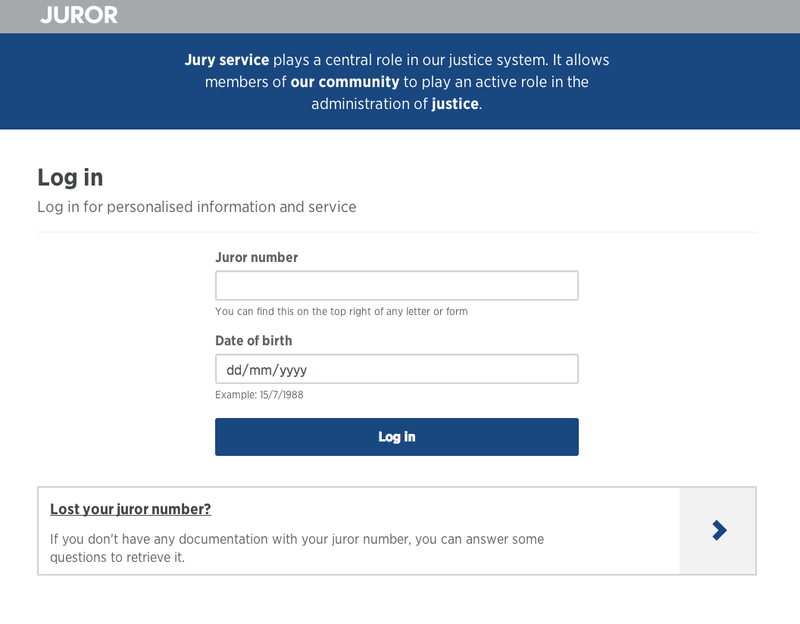 Nicola Church, Acting Manager of Jury and Court Administration, who talked me through the new Jury Management System, said: "it feels like a completely new service - honestly it has really changed how we do things." First off the admin team checks for potential jurors for a region. An algorithm randomly selects potential candidates, who are then checked for eligibility using links to cross-departmental data. 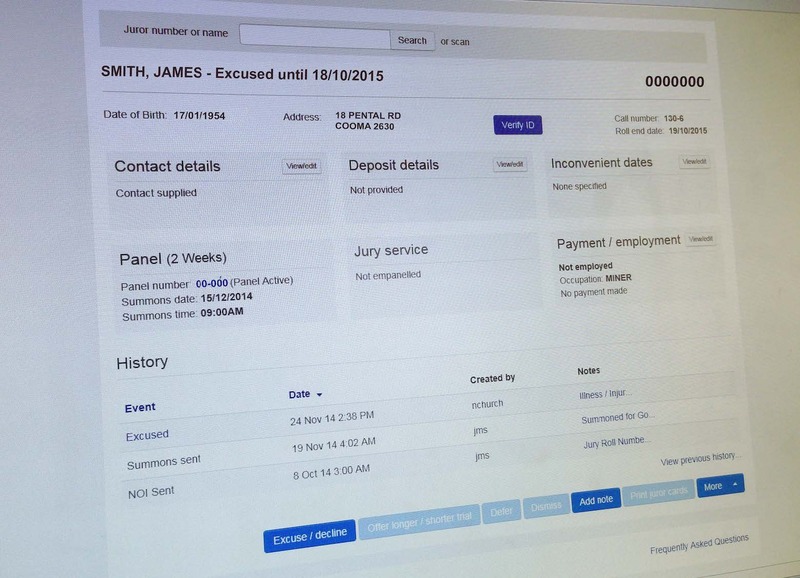 The new system helps the team to manage the demand for jurors and is much more intuitive. Staff can use the new system unaided in under an hour, compared to the old system - where it took a week for them to get up to speed. 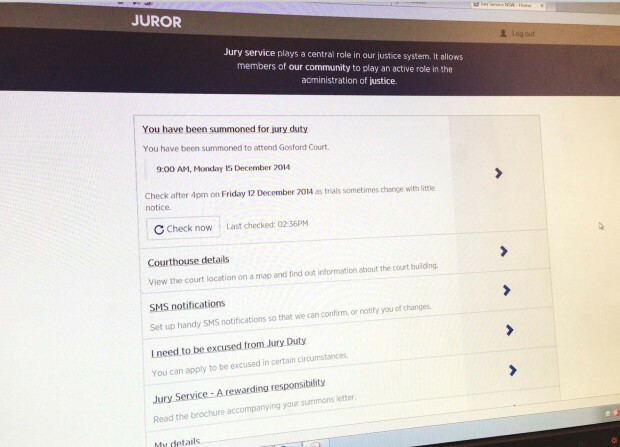 Potential jurors get a letter to notify them of inclusion (possible selection) or a summons (call to be selected for jury duty). This provides them with the log-in details for the digital service. 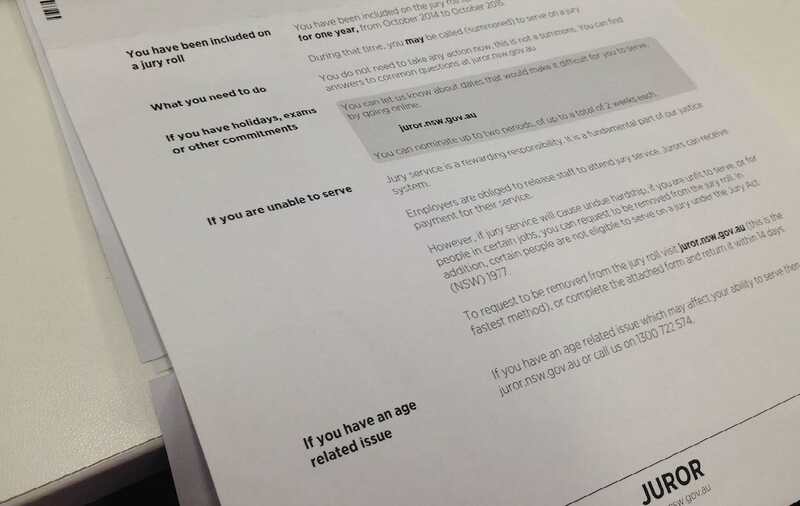 At each stage the online service prompts users with the actions they need to take - allowing them to check their status online and amend their details. Nicola explained that "in the past, updating an address is something they would have had to call us for, and now it can be done online". Since the service was launched some 34,000 people have updated their email details online and 22,000 have updated their phone details. Users can apply for exemption from jury service online by uploading any required documents, like letters from the doctor. These uploads are sent to staff for a response, who then let the user know the outcome through their preferred contact method. When jurors are summoned the court uses a new check-in service that has cut waiting times. In the Downing Centre Courts in Sydney, which processes about 1,600 people per week, the waiting time per person have been cut from 3 hours to 30 minutes. The team have found the analytics supporting the service to be extremely useful and hope to implement further changes by learning from the patterns they are seeing in the data. So many great achievements for the team, but the biggest success is happy users! 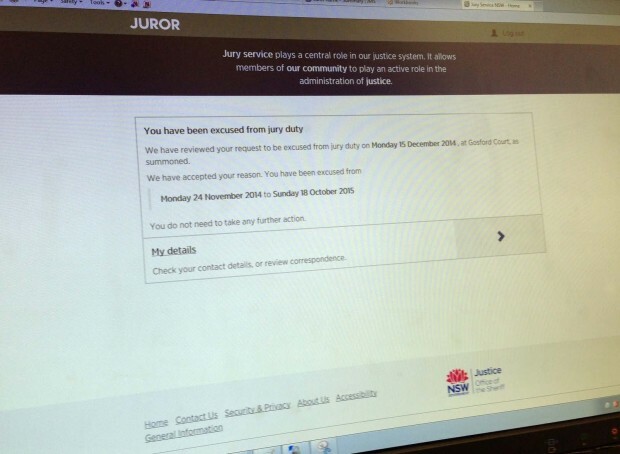 In terms of facilities with departments in the public sector, I just want to say — the way in which the jury website is set up is phenomenal. For me this feels like a really timely meeting for our own team, which is looking at digital options for services for the jurors in England and Wales. The NSW service could be a great opportunity for collaboration and sharing best practice. Many thanks to the NSW digital court and tribunals team — Dominic, Julian, Nicola, Gerry, Ben, Michael W and Michael T for sharing your time and work. I look forward to us collaborating on some digital services soon! Keep in touch: sign up to email updates from this blog, or follow George on Twitter.